Since 2004, Phoenix Feeds & Nutrition has grown from humble beginnings on North Street in New Haven, Vermont, to a widely recognized leader in the New England-New York dairy feed industry. Phoenix Feeds & Nutrition understands its customers’ daily struggles and knows making a living in today’s increasingly commercialized dairy business is not easy. This is why the company strives to deliver top-quality nutrition science and high-quality, custom-blended feed at a reasonable rate. 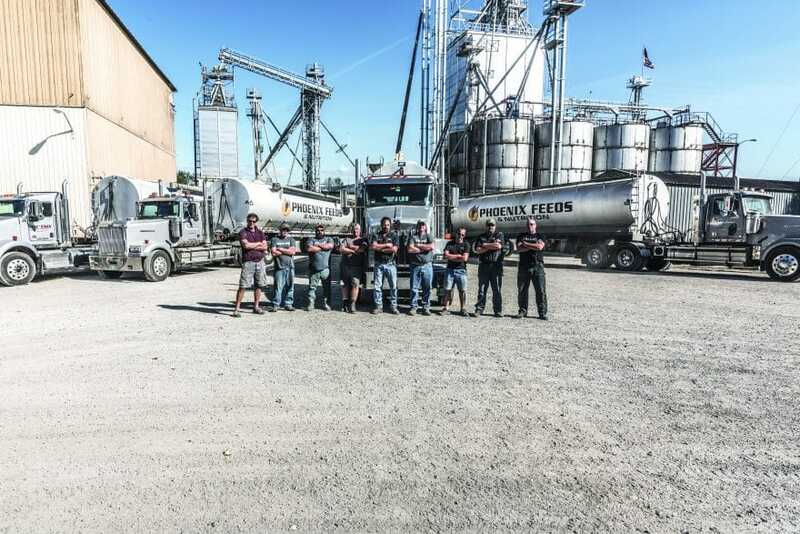 Phoenix Feeds & Nutrition is reinvesting resources in facilities, equipment and new technology to increase capacity and efficiency and better serve its customers. Today the company has 45 employees, serving customers throughout six states in New England and northern New York. Phoenix Feeds & Nutrition strives to deliver the products and services that help farmers succeed. David says there’s no one-size-fits-all solution because no two cows or farms are exactly alike. “We want to ensure that the animals we feed get the best feed and the best nutrition they can receive so that those animals are healthier, they produce cleaner, safer milk and to make sure the end consumer is getting the best product they can get,” he says. The company has feed ingredients on hand to mill and mix to every farms’ individual diet on-site, which also minimizes cost and wait time for customers. “We only use the highest-rated ingredients in our feed, which we mix right here in Vermont,” says Santos. Taking a progressive, proactive approach to new ideas and improvements has helped Phoenix Feeds & Nutrition remain a step ahead in the competitive dairy feed industry. “We’re always doing something new here,” says Santos. It’s been a year of big changes for Phoenix Feeds & Nutrition. The company is pushing for improved processes and procedures, as well as staying on top of technology and putting proper infrastructure in place to further success. “I’m the executive editor of the magazine,” adds Santos. Sharing its customers’ stories is important to Phoenix Feeds & Nutrition because, at the end of the day, it’s all about helping farmers succeed. “We’re tied to the profitability of the farmer,” says Santos. By bringing custom capabilities that work for each unique farming operation and powering that with state-of-the-art technology and nutrition science, Phoenix Feeds & Nutrition is delivering a superior product and a neighborly business approach.